Some of the Wackiest Arguments Against Nitrogen Tire Inflation Happy Holidays from Nitronomics! This is a guest post from Scott Grayson. It is no secret that our reflexes slow down as we age. Psychologists and other researchers have determined that as we age, our cognitive ability to consider our surroundings and make appropriate decisions slows down significantly after age 65. Many gerontologists and psychologists today believe we can train our brains to improve our response times. After reviewing data from a University of Kentucky study on brain games and aging adults, Dr. Susan Whitbourne, Ph.D., said the results showed it is possible to “overcome the effects of aging on the mind and body through exercise, practice, and just plain determination”. Another encouraging finding of the study was that improvements were still evident two years after participants discontinued brain-training activities. Just slowing the deficits that naturally come with aging is a phenomenal benefit for older citizens who want to remain engaged in an active lifestyle. Recently, new benefits are available to older adults who take an active role in monitoring their personal-response times. Jerry Edgerton, a columnist and contributor for CBS News, reported on pilot programs targeted at older drivers sponsored by coverage providers. The pilot programs engaged older drivers in brain-training exercises designed to improve the peripheral-vision field, thereby improving response time and reaction to dangerous-driving conditions. Insurance companies are responding positively to the pilot studies. Along with the benefits of lower rates through brain training, companies offer tips to keep your good-driving record. Drivers should take an active role to ensure they enjoy vehicle insurance discounts. Here are a few tips on how you can ensure that you are maintaining safe driving habits while holding onto your right to stay on the road. Drive the speed limit – Too slow is just as dangerous as too fast. Keep informed about current laws – Watch for new stop lights and speed-limit changes in your town. Take a driving course designed for people over the age of 55 – Courses are available online and in a classroom setting in most areas. Evaluate your car for comfort and function – Be sure the car is not too large or two small, check for blind spots, adjust your seat for the best vision field around you. It might seem as if it’s a sign of getting older to use anti-lock braking systems and lane-departure warning systems, but not a sign of weakness. 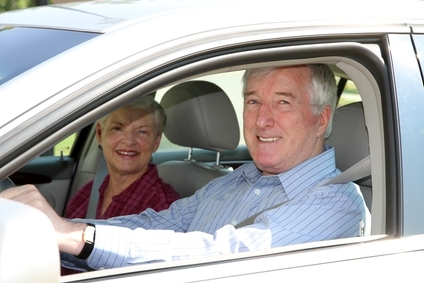 Age offers experience and intelligence and the appreciation for safety, which is why AAA offers anti-lock braking systems at a special discount to the elderly. Another handy tip to keep in mind is filling your tires with Nitrogen. Popular Mechanic’s Mike Allen suggests that since Nitrogen is less likely to migrate through rubber than oxygen, keeping air pressure in a tire that is filled with Nitrogen will be stronger for a longer period of time, which cuts the likelihood of having to change a flat tire in half. These safety tips are designed help drivers of all ages practice safer driving habits while on the road. If you are considering a new car, make this part of your discussion with the sales agent. Contact your policy agent or auto dealer for information about your car’s technology. Understanding how these systems work will offer you a safer and, in the end, a more enjoyable driving experience. Aging drivers over the age of 65 will become the largest driver pool in our nation within 15 years. Finding ways to improve their safety on the road, while working with their waning reflexes, means a safer driving experience for them and everyone else who shares the road with them.